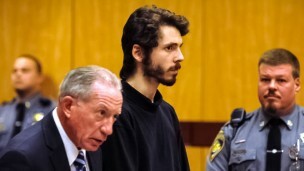 Eric Lonergan plead guilty to charges in connection to the Molly/MDMA-related poisonings last February, after Zachary Kramer did the same last month. A second former student has plead guilty to federal drug charges, after a series of hospitalizations last February lead to the arrest and expulsion of five Wesleyan students. According to the Hartford Courant, Eric Lonergan entered a plea deal in New Haven’s U.S. District Court on Monday, Nov. 30. The charge was conspiracy to possess with intent to distribute the synthetic party drug Molly/MDMA. Under the deal, prosecutors will recommend 30 to 37 months in prison and a $1 million fine. “I conspired with Zachary Kramer and other students to distribute MDMA at Wesleyan University,” Lonergan said in court, according to The Courant. According to the New Haven Register, Lonergan is accused of selling MDMA from his dorm room for around $200 per gram, beginning in November 2013. He allegedly provided drugs to students at a party in September 2014, leading to a string of hospitalizations. Kramer allegedly replaced Lonergan as the primary supplier of MDMA on campus in December 2014. “Wesleyan students who bought these drugs from this dorm-room chemist literally risked their lives by relying on his purported expertise,” said U.S. Attorney Deirdre Daly, according to WFSB. Lonergan was arrested in March along with Kramer, who also faced federal charges, and three other students, who are facing state charges. On Thursday, Nov. 12, Kramer pleaded guilty to conspiracy to possess and distribute MDMA and synthetic marijuana. His plea deal recommends a sentence of 12 to 18 months. The Courant reported that cases against former students Andrew Olson, Rama Agha al-Nakib, and Abhimanyu Janamanchi are currently pending in Middletown Superior Court. Lonergan is scheduled to be officially sentenced on Feb. 25, 2016, while Kramer will be officially sentenced on Feb. 10. At one point I pledged and lived in the house for two years. It was a horrible experience to be so isolated. Am I still a DKE brother ? I’ll leave that up to You. Never forget that the Wesleyan admiistration’s issue avoidance and weakness was a big contributor to the environment that made this incident possible. And so we see the true purpose of Wesleyan. Training drug dealers, whiners and complainers. Just what Wesleyan doesn’t need. Another negative news story. Again, it speaks to administrative sloth.